See all Black and Tan Coonhound characteristics below! One of America's canine aristocrats, the Black and Tan Coonhound's bloodlines hark back to the Talbot hound of a thousand years ago, yet he's completely a creation of the mountain people of the Ozarks and the Smokies. Nose to the ground, he singlemindedly trails his prey, primarily the raccoon but also mountain lions, bears, deer, and other game, "barking up" when his quarry is treed. 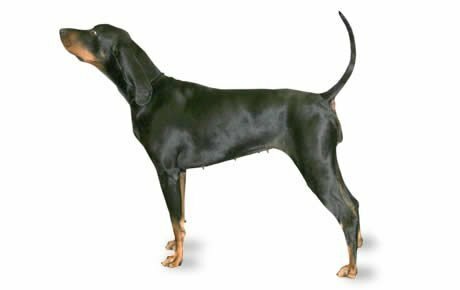 Of the six coonhound breeds, the Black and Tan is the one most frequently recognized, notable for his size and distinctive coloring. Among hunters, he's famous for his cold nose; that is, the ability to pick up and follow an old trail, no matter how faint. Because of his strong hunting instinct and specialized skills, the Black and Tan Coonhound is rarely thought of as a family dog. Still, for people who admire the hound's independent nature and sense of humor, he can make an excellent companion and at home he tends to be laidback, playful, and gentle. 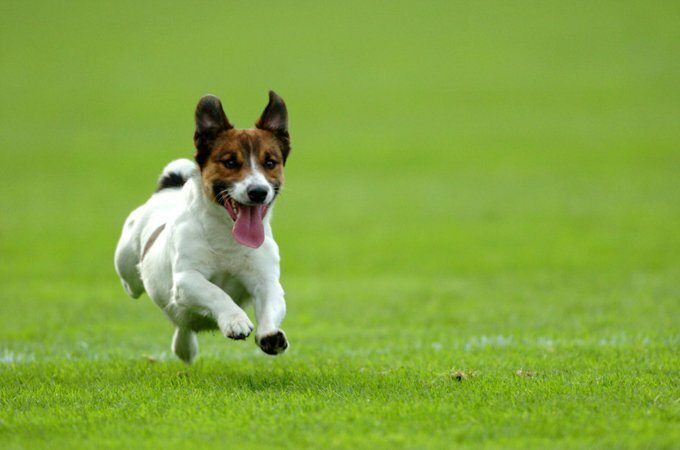 The stamina that makes this Hound a great hunting dog also makes him an excellent jogging or running companion. But he's equally satisfied with a good daily walk, especially if there's plenty of sniffing time built in. Afterward, expect him to sack out on the sofa, preferably in or near your lap. This is a dog who likes his comforts. Black and Tan Coonhounds are fond of children and willing playmates. They get along well with other dogs and can even be buddies with cats if properly introduced. They possess good watchdog skills, and are likely to sound off with a deep-throated bark to alert you that someone's approaching. This dog is big enough to look intimidating, but unlikely to bite or otherwise harm anyone. As with every breed, Coonhounds have some drawbacks. For one thing, they can have a houndy odor. This is something you'll either love or hate. Be sure you love it, because it can't be washed away for more than a day or two. Also, these dogs can sing. No, you're not getting the Mormon Tabernacle Choir here but the deep bay of a hound who's treed a squirrel, cat, or other furry animal foolish enough to enter your yard. Lots of people love the music of the hounds, but those people might not include your neighbors. Nor is this a breed for the houseproud. Black and Tan Coonhounds drool when it's hot, slobber after drinking water, and shed heavily. Finally, he's not for the faint of heart. A Coonhound needs a leader who's as stubborn and smart as he is. Still, if you can have a sense of humor and can accept his drawbacks, plus provide the Black and Tan with the human companionship he loves, moderate daily exercise, and firm, consistent, patient training, it's hard not to fall in love with this breed. The largest of the six coonhound breeds, Black and Tans range in weight from 75 to 100 pounds. Males stand 25 to 27 inches at the shoulder, females 23 to 25 inches. This working scenthound was bred to work closely with other hounds, so he knows how to go along and get along with canine pals. With people he doesn't know, he might be reserved but never shy or vicious. He can be headstrong and likes to have his own way, but with firm, consistent, patient training the Black and Tan Coonhound is a well-mannered companion, albeit one who's slow to mature. Expect to have a fun-loving puppy on your hands for at least three years. At home he's an easygoing friend, but put him on a scent trail and he's as serious as a heart attack. This compulsion to follow his nose means you won't ever want to have him off leash unless you're in an enclosed area. As with all breeds, the Black and Tan Coonhound can be prone to certain health conditions. Hip Dysplasia (HD): This is a heritable condition in which the thighbone doesn't fit snugly into the hip joint. Some dogs show pain and lameness on one or both rear legs, but you may not notice any signs of discomfort in a dog with hip dysplasia. As the dog ages, arthritis can develop. X-ray screening for hip dysplasia is done by the Orthopedic Foundation for Animals or the University of Pennsylvania Hip Improvement Program (PennHIP). Dogs with hip dysplasia should not be bred. Hip dysplasia is hereditary, but it can be worsened by environmental factors, such as rapid growth from a high-calorie diet or injuries incurred from jumping or falling on slick floors. Cataracts. A cataract is an opacity on the lens of the eye that causes difficulty in seeing. The eye(s) of the dog will have a cloudy appearance. Cataracts usually occur in old age and sometimes can be surgically removed to improve the dog's vision. Note: Responsible breeders use only physically sound, mature (at least two years or older) dogs, and test their breeding stock for genetic diseases pertinent to the breed. Both parents should have health clearances, documentation that a dog has been tested for and cleared of a particular condition. In Black and Tan Coonhounds, you should expect to see health clearances from the Orthopedic Foundation for Animals (OFA) for hip dysplasia (with a score of fair or better) and from the Canine Eye Registry Foundation (CERF) certifying that eyes are normal. You can confirm health clearances by checking the OFA web site. Health clearances are not issued to dogs younger than two years of age. That's because some health problems don't appear until a dog reaches full maturity. For this reason, it's often recommended that dogs not be bred until they are two or three years old. Being a pack dog, the Black and Tan Coonhound is among the few breeds who can adjust to kennel life and even live outdoors — if it's not too cold, he's with another social dog, and he's given warm, dry shelter. But if he's an only dog, he should live indoors with his human pack so he doesn't get lonely. If you do keep him outside, make it during the day only and bring him in at night. He'll need a large fenced yard since hounds are the original "travelin' man" and will roam for miles if they catch whiff of an interesting scent. A fence keeps your Black and Tan Coonhound safely at home. Note: An underground electronic fencing isn't strong enough to contain him. Because of his tendency to wander, it's essential that a Coonhound be tattooed and microchipped and always wear a collar with identification tags. Coonhounds are big enough to countersurf, and they'll eat anything you leave within reach. Put the garbage up high, and don't leave pies, bread, roasts, or any other goodies cooling on the counter, or they'll be gone when you turn your head. It is important to crate train your Coonhound puppy. Puppies explore, get into things they shouldn't, and chew stuff that can harm them. It can be expensive both to fix and replace destroyed items, not to mention the vet bills. Crate training ensures not only the safety of your puppy but that of your belongings. While they're mainly sweet and easygoing, Black and Tan Coonhounds have the independent and stubborn nature common to hounds. They've been bred to work on their own, and don't necessarily see why they should have to do things your way. On the plus side, they generally housetrain quickly. Obedience training is highly recommended, but don't count on perfect compliance. This is a dog who enjoys putting his own spin on obedience commands. Use treats and positive reinforcement techniques to persuade your Black and Tan that he wants to do as you ask. And "ask" is the operative word. Hounds will flat-out ignore you if you try to boss them around. When training a Black and Tan Coonhound, bear in mind the saying that you catch more flies with honey than with vinegar. Recommended daily amount: 3 to 5 cups of a high-quality dog food daily, divided into two meals. Hounds like to eat. Monitor your Black and Tan Coonhound's food intake so he doesn't get fat. Keep your Coonhound in good shape by measuring his food and feeding him twice a day rather than leaving food out all the time. If you're unsure whether he's overweight, give him the eye test and the hands-on test. For more on feeding your Coonhound, see our guidelines for buying the right food, feeding your puppy, and feeding your adult dog. A short, dense coat protects the Black and Tan Coonhound as he trails his quarry through rough brush. It is, of course, black, with rich tan markings above the eyes, on the sides of the muzzle, and on the chest, legs, and back of the thighs. The toes bear markings that look as if they were made with a black pencil. Brush the Black and Tan two to three times a week with a hound mitt or firm bristle brush to distribute skin oils and keep loose hair from floating off the dog and onto your furniture and clothing. Check and clean his long, graceful ears weekly to prevent infections. Bathe as needed. Other grooming needs include dental hygiene and nail care. Brush your Black and Tan Coonhound's teeth at least two or three times a week to remove tartar buildup and the bacteria that lurk inside it. Daily brushing is even better if you want to prevent gum disease and bad breath. Nails should be trimmed regularly to keep them short. Your Black and Tan's nails may need to be trimmed weekly or only monthly; each dog is different. If you can hear the nails clicking on the floor, they're too long. Short, neatly trimmed nails keep the dog's feet in good condition and keep your legs from getting scratched when your Coonhound enthusiastically jumps up to greet you. Get your Coonhound accustomed to being brushed and examined when he's a puppy. Handle his paws frequently — dogs are touchy about their feet — and look inside his mouth and ears. Black and Tan Coonhounds are often acquired without any clear understanding of what goes into owning one, and these dogs often end up in the care of rescue groups, in need of adoption or fostering. Other Coonhounds end up in rescue because their owners have divorced or died. Contact rescue organizations for more information about available dogs and adoption requirements. Below are breed clubs, organizations, and associations where you can find additional information about the Black and Tan Coonhound.